Hello ... Hello ... my old friends ... It's great to see you once again! One of the benefits of getting onto Facebook is that Yours Truly KJS has managed to touch base with not a few folks who share the same love and interest in in the ELO Beatles Forever [and related artistes] universe. One of those blessings is being able to converse with and interact with those musicians who inspire us so much. 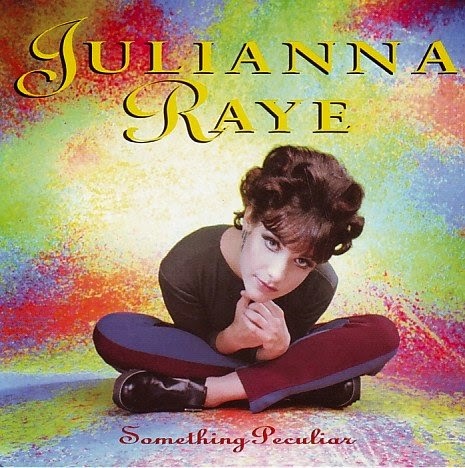 I have had the pleasure this last week of conducting an interview with Julianna Raye, who released her critically acclaimed album back in 1992 entitled "Something Peculiar". produced by Jeff Lynne and also featuring Richard Tandy, Mike Campbell and Richard Dodd. KJS: What was your goal for this album at the time? JR:. At the time grunge was happening and I didn’t relate to it particularly. I wanted to focus on classic pop songwriting with sing-able melodies people would remember for years to come. Growing up I was very influenced by the Beatles and I think that’s what caught Jeff’s ear and made him decide to work with me. KJS: What was it like working with Jeff Lynne but also the then team that included Richard Tandy, Richard Dodd and Mike Campbell? JR: Well, it was mainly Jeff and Richard on the day to day. Richard Tandy and Mike Campbell came in for some sessions and they played beautifully!! With Jeff and Richard D., it was a bit intimidating because I was so green and they were used to working with people who had spent loads of time in the studio. There was a tremendous learning curve just getting to understand my voice in the mic and how to correct pitch and take direction. Also their British accents sometimes made it hard to understand them! Plus they were used to working with boys, who typically don’t cry when they get frustrated. J Looking back it all seems quite funny now. At the time it was like being in recording artist boot camp! Jeff taught me a tremendous amount about songwriting … he was my first and best editor. He really helped me understand the structure of a pop song. He also defined my sound as a vocalist. He cut the vibrato out and exposed the pure voice underneath. He gave me my foundation as a singer/songwriter. KJS: For me all the songs have a familiar [if not "Something Peculiar"] sound but taking aside Jeff's 'flavour', please tell me briefly about their inspiration? JR: I was writing about what was familiar and meaningful to me so personal relationships on songs like My Tribe, In My Time, Something Peculiar, etc. and portraits of the people I love, like Laughing Wild, Nicola and Taking Steps. I was writing about people and situations where I had a message or insight I felt strongly about and wanted to communicate. KJS: I particularly like the track "My Tribe" but what is your favourite track? JR: The track I always go back to on that record is "Laughing Wild". It seems to do all the things I want it to do and I really like the feel of it. KJS: What is Julianna Raye doing now in 2010? JR: My most recent project was a Bossa Nova inspired CD called Dominoes. Dominoes has gotten some cool opportunities. In 2009, it was nominated for an Independent Music Award and Peter Gabriel hand-picked it to be part of his B&W Music Club series. Dominoes has just been licensed by a Japanese label, Vivid Sound for release in Japan in 2011. I’m also a long time meditation practitioner and trainer and I’ve started a company called Pop Go Zen, which integrates meditation techniques with listening to pop music. Lots of people want and need to meditate but sometimes it can be hard to make the time. Pop Go Zen teaches people a method that’s fun and engaging to make the process easier. KJS: Could "Something Peculiar" ever be re-mastered and/or re-released? JR: Well legally it's available for that so if a company came along and wanted to do that it could happen. At this point there are no plans for that. Sadly when people purchase it, I don’t see a penny! You never know what’s around the corner though. When I moved to LA I never expected to get the opportunity to work with someone like Jeff. Life is full of surprises! ELO Beatles Forever [ELOBF] recommends "Something Peculiar" by Julianna Raye to those enlightened folks who enjoy the music of ELO, Jeff Lynne, Roy Wood, The Move, The Idle Race, 'Brum Beat', The Beatles and related artistes. I love My Tribe : superb ! I also loved her I'll Get You Back video. Thank you Keith for this amazing interview. Thank you very much for this stuff! It's Great! "Something Peculiar" is an amazing album! My favorite track is Something Peculiar.